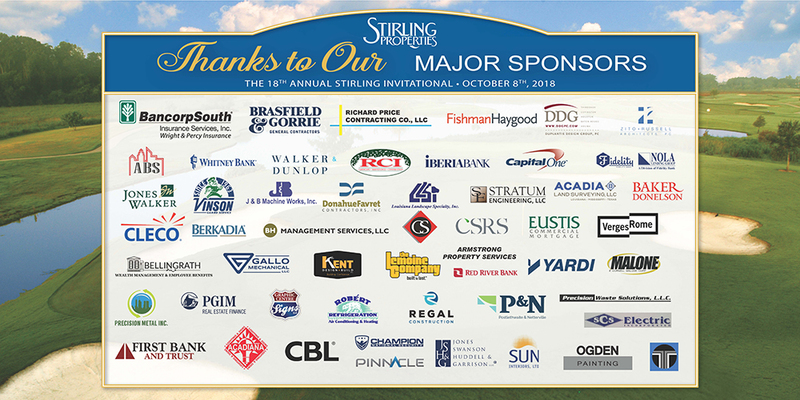 Stirling Properties hosted its 18th Annual Stirling Invitational Golf Tournament on Monday, October 8th at University Club Plantation in Baton Rouge, Louisiana. This year’s tournament successfully raised more than $25,000 for local charities! 113 participants enjoyed a variety of friendly competitions in addition to 18 holes of scramble golf tournament play. Congratulations to the 1st Place Low Net winners, Stuart Bonaventure, Ryan Juneau, BJ Branigan and Trent Sandahl. The Low Gross winning team included Andy Coleman, David Laizer, Tommy Buckel and Dennis Shill. The Longest Drive award went to Marc Bourgeois, and Closest to the Pin prizes were presented to Eric Landry, Paul Geyer and Chip Songy. Additional awards were given for 2nd, 3rd and 4th Low Gross and Low Net. A special shout out to the Highest Gross scoring team, William McKnight, Beau Egan, Elliot Turner and Neal Choppin. However, the real winners of the day were the local nonprofit organizations that benefited from the tournament proceeds. Ochsner Foundation received $10,000 from the proceeds, and the remaining profits will be distributed to various local charitable causes. Representatives from Ochsner Foundation were on hand to receive a check for their contributions. Grady Brame, Executive Vice President with Stirling Properties, presented a check to Louisa Post, Ochsner Foundation’s Director of Development for Baton Rouge, during an awards celebration and cocktail reception following the tournament. Rick Perry, President and CEO of Tiger Athletic Foundation, was also presented with a $1,000 check to TAF for the LSU Golf Team. 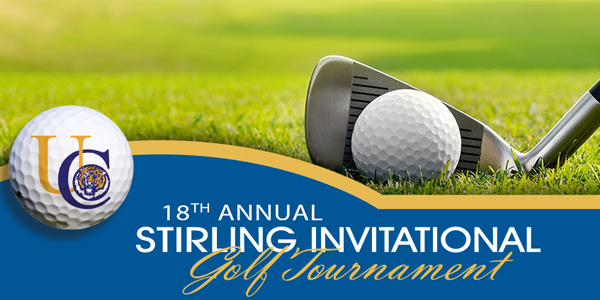 The Stirling Invitational Golf Tournament has contributed more than $239,000 to numerous organizations over the past 18 years. Thank you to all of our friends and supporters who participated and contributed to the Stirling Invitational Golf Tournament. This event would not be possible without you. Additional sponsors include Netchex, Newmark Knight Frank, Metairie Bank, Real Estate Tax Group, Big Easy Parking Lot Maintenance, Gulf South Electric, Dixie Office Products, Metro Mechanical Inc, Covington Electric Services Inc, Geiger Heating & Air, Jones Fussell LLP, PMAT Real Estate Investments LLC, Premium Parking, River Parish Disposal, Certified Air Conditioning, Roth Law Firm LLC, Ryan Gootee General Contractors, Larry Loyd Construction Co. Inc, ITS Fire Alarm Security, Southeastern Waterproofing, Trimark, Palmisano Group, Robert Levis Development LLC, Mullin Landscape Associates, Premier Service Team LLC, Codaray Construction LLC, Chrestia & Inc, B&G Lawn Maintenance LLC, Gene Nims Builders, NcNeer Electrical Contracting Inc, Dale’s Paving Inc, Southern Farm Bureau Life Insurance Company, CMC (Calcasieu Mechanical Contractors), Angelos Landscaping, Cook Moore & Associates (Cornerstone), Cost Segregation Services Inc. (CSSI), Huseman, Jeffrey Lipp Parking Lot Services, Precision Concrete Cutting of Louisiana, Professional Maintenance Services, , Unit Design Inc, Thermal Products Inc, Grass Unlimited, Crystal Clean Sweeping, Landry’s Lawn, T.L. Construction LLC, ACA Mechanical Industrial Inc, CertaPro Painters, CJ Ladner (State Farm), Sign Lite, Jimmy Maurin, James Hudson, and Roger Ogden. A huge shout out to Fidelity Bank for sponsoring lunch.